Please call to verify that we have this item in stock. A physician order / physical therapy or occupational therapy order MAY be required in determining proper seating options and accessories. For right seating options and proper sizing an Assistive Technology Professional will do a telephone or an actual physical evaluation to help you rent the proper rehab wheelchair. If you want the same specifications of your current electric wheelchair please provide the serial number and we'll try to match the rental chair accordingly. We provide a general seat cushion with your rental, if you require a different cushion (Roho, Jay...) you need to use your own or purchase one. Conquer your day with a suspension meticulously engineered to help you maintain better positioning, feel more secure, and reduce driving fatigue. The precision engineering of the M3 Corpus helps ensure improved drive performance and a more consistent driving experience for all users. This is especially true at low speeds, in tight areas, or while using a variety of alternative drive controls. The world is at your fingertips as you explore your environment with the M3 Corpus’ unrivaled 12″ of seat elevation and 20º ActiveReach Technology all without sacrificing comfort because the M3 maintains full suspension at ANY elevation, seating position or driving speed. 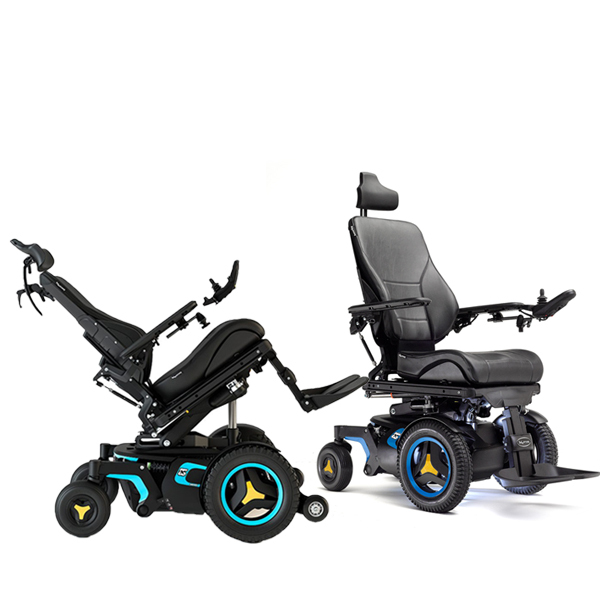 Truly making it one of the world’s most capable Mid Wheel Drive power chairs. If you want the same specifications of your electric chair please provide the serial number and we'll match the rental chair accordingly. The F3 Corpus proves that small things can pack a big punch. The F3 takes full advantage of Permobil's Corpus® Seating System and Active Reach™ technology to deliver a full range of seating functions including up to 12" of elevation and 30º of anterior tilt. Combine all that with its compact size, the F3 Corpus puts you ahead of the curve. Minimum Turning Radius 20.5” 26.5"
Seat-to-Floor Height 17.5”, 18.5”, 19.5” 17.5", 18.5", 19.5"
Optional Seat Elevator 12” 12"
Armrest Pad Lengths 10”, 13”, 16”, 18” 10", 13", 16" & 18"